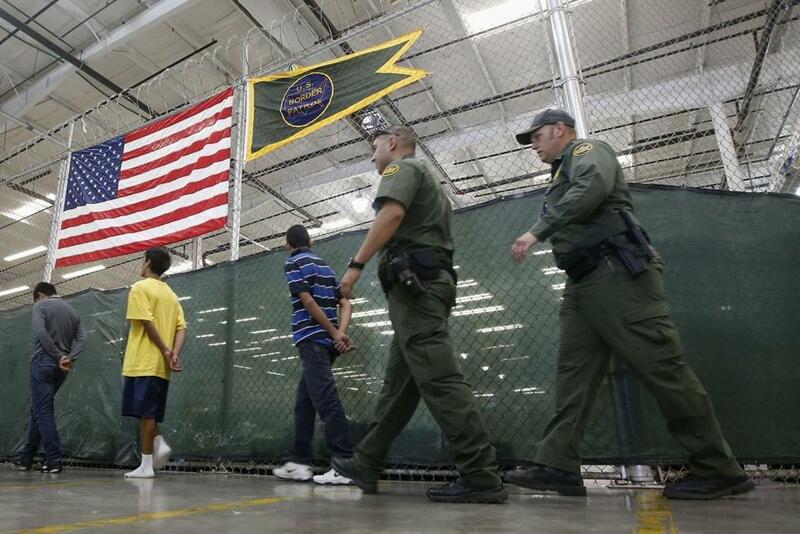 Young detainees at a Nogalez, Ariz., placement center were escorted to make phone calls. Senate Democrats from Massachusetts and other states are pushing the Obama administration to stop deportations to parts of Central America as immigrants continue to seek refuge at the southern border. Lawmakers — joining teachers, lawyers, and immigrant advocates — say people are continuing to flee El Salvador, Guatemala, and Honduras because of human smuggling, drug trafficking, and some of the world’s highest murder rates, and they are urging President Obama to grant them protection instead. Nationwide, a majority of unauthorized immigrants are from Mexico, but in Massachusetts, immigrants from Guatemala, El Salvador, and Honduras are among the largest groups facing deportation in immigration court, according to Trac, a Syracuse University organization that tracks immigration court filings. Markey and 25 other Senate Democrats last month said the Obama administration could consider granting newer arrivals from El Salvador, Guatemala, and Honduras temporary protected status, a form of protection that does not lead to citizenship. In a letter to Obama, the senators cited a study that said 83 people deported to those countries since 2014 were later killed. “Instead of responding with deterrence and enforcement we can and should do more to address the violence and instability in the region that is forcing these families to leave their homes,” Reid said in a statement. The lawmakers’ actions followed reports that US Immigration and Customs Enforcement, or ICE, is continuing to detain and deport recent border crossers, including families. In January, officials rounded up 121 immigrants across the United States and deported most of them to Central America and Mexico. Advocates reported new roundups in May and June. An ICE spokesman said the agency’s priorities for deportation include immigrants who illegally crossed the border since 2014 and were ordered deported by a judge. He said the Homeland Security agency is not targeting people with pending cases for asylum or other relief. Reports of new arrests surfaced as the number of people caught crossing the southwestern border climbed to 40,366 in May, nearly 9,000 more than the same month last year, though in June the number of arrests declined to 34,463, according to the most recent figures from Customs and Border Protection. Though significantly lower than the 60,683 people apprehended in May 2014, the numbers concern critics of illegal immigration who say the federal government should deport people more quickly. Though some immigrants are fleeing violence, critics say others are breaking the law to work or join relatives in the United States. “For a lot of people . . . mainly, they want to join their brother-in-law who offered him a job at their body shop,” said Mark Krikorian, executive director of the Center for Immigration Studies, which favors limits on immigration. The latest debate over immigration arrives as the clock is ticking on Obama’s final term. Before taking office in 2009, he pledged to seek a solution for 11 million immigrants in the United States illegally, but his efforts were stymied first by Congress and then the Supreme Court. ICE has deported hundreds of thousands of immigrants during Obama’s tenure. An estimated 11 million immigrants are in the United States illegally, including about 185,000 in Massachusetts, according to the Migration Policy Institute. In May, a 36-year-old man named David testified in Boston immigration court that a gang member in El Salvador had raped his 12-year-old daughter and then threatened to kill his whole family. After a medical doctor confirmed the assault, David sent his wife and children to the United States. “I knew they’d be safe here,” David, whose last name is being withheld because he fears for his life, said in Spanish. He and his mother-in-law followed after gang members threatened them, too, and both were jailed after they arrived in the United States. David’s lawyer said he was ineligible for asylum because he had tried to cross the border illegally in 2013 and was deported, but she asked the judge to withhold his deportation, a more limited protection that is not a path toward citizenship. Detainees walked in a line at a US Customs and Border Protection processing facility in Brownsville, Texas. Immigration Judge Paul Gagnon, a former US attorney, ruled that David’s testimony was credible and that he would not be deported to El Salvador. But immigration officials jailed David, who has no criminal record, for two more weeks. His lawyer Talia Barrales said an official told her they were trying to deport him to Honduras or Guatemala instead. “Holding people like this doesn’t make sense,” Barrales said. Meanwhile, David’s mother-in-law remianed in jail in Texas and could be deported. Advocates for immigrants say they are increasingly worried about immigrants who are facing immigration court without a lawyer. A Globe analysis of immigration court data shows that most recent border crossers, who are priorities for deportation, did not have a lawyer at their court hearings. And 81 percent of the 34,434 people ordered deported since mid-2014 were not present at their hearing. Critics say immigrants might have skipped their hearings, but advocates say many did not know when they were being held. Yennifer Juarez, a 27-year-old mother from Guatemala, said she missed her immigration hearing in June 2015 — and was ordered deported in her absence — because she was stuck in traffic on her way from Providence to Boston. In May, immigration officials detained her and her sons, ages 5 and 10, and jailed them in Texas. Desperate, she contacted the Globe through a volunteer, Jenna Pollock, a recent law school graduate from Massachusetts. Juarez said she fled Guatemala because her estranged husband and his brother had threatened to kill her. She said she had wanted to testify in court that she feared for her life if forced to return home. “I had proof with me,” she said. Immigration officials released her last month after the Globe inquired about her case, and volunteers helped her request a new hearing.